It costs more to acquire a donor than it does to retain a donor. That’s why tools that enable lasting relationships with donors are important to organizations. 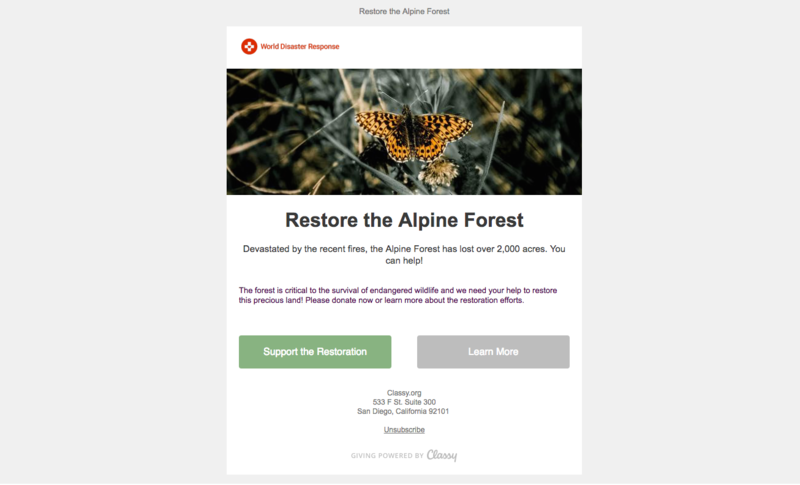 Over the years, we’ve been lucky to see Classy clients create moving emails that seamlessly match their campaigns in the Classy Fundraising Suite. Now, to make it even easier for you to coordinate email sends with campaigns, Classy has built out the first phase of a much grander vision that will eventually be a full suite of supporter engagement tools. The new email system provides the customizations you need to create brand-centric, personalized emails more efficiently. Every email can have its own unique “reply-to” address, copy, and branding, so your organization is always in full ownership of what you communicate to supporters and how they can re-engage with you. In the future, email list segmentation and advanced tracking will provide even more ways to connect with the right donor, at the right time, through Classy. Here are four emails available to you right now with Crowdfunding campaigns, along with how and why to use them. How to use it: Access the donation receipt through the “Donation Emails” link on your Email Tab. You’ll want to customize the messaging of your donation receipt to match that of your campaign. Also, ensure the “reply-to” email address matches the individual or department that handles customer service, so supporters can easily get in touch with you. Why use it: Aside from being a tax requirement, it’s a feature we’ve always had at Classy. However, the upgraded receipt makes it easier for you to make a meaningful connection with a donor when they’re still excited about their gift. A receipt may seem an unlikely place to add an extra touch, but there’s no better way to make an impression than a surprising, nice message. Another bonus? The receipt itself is now attached as a printer-friendly PDF, so your supporters can keep records of their gift however best suits them (without the hassle for you). How to use it: Once on your campaign’s Email Tab, click “Campaign Messages” and select one of the three templates provided: Blank (get creative! ), Image (add a visual to motivate supporters to give), or Text (think letter from your executive director). These emails include customizable content blocks, so your organization can set the scene and tone for your campaign’s cause. How to use it: Access this email by clicking on the “Supporter Notifications” from your Email Tab. Like a donation receipt, the recurring profile email is an opportunity for your organization to strengthen its connection to a committed supporter. We recommend using this email’s text to hone in on how their monthly contribution is already making a difference and welcome monthly donors as a critical part of your organization’s work. Why use it: Monthly supporters are incredible people. They’ve made a statement that they wholeheartedly believe in your cause; so much so that a portion of their income will go to your organization every month! Making these supporters feel extra special keeps them motivated to maintain, or even grow, their gift over time. Why use it: It requires serious time and resources to track down recurring donors with failed and expired cards. This system email makes it faster to reach out to supporters because they’re auto-triggered upon failed transaction. Customer retention is a huge piece of maintaining the quality and growth of any organization. Trust built on delight, appreciation, and transparency creates a supporter base that backs your brand and cause. And that community will more likely be willing to contribute to you financially. The supporter engagement features on Classy aim to help you build that strong base. These emails are only a preview of additional engagement opportunities we’ll tackle in the future. UPDATE 2/17/2017: See what’s new with Classy Emails in our January Product Update.